Quai Conti is one of our favorite sofa designs at Form & Function. It is an uncluttered, classic form, hand-made in Duvivier’s manufactory in France. Available with a solid Beechwood base in a choice of stock or custom finishes, as well as a smoked chrome-plated steel. Available in a wide range of leathers and colours as well as a sophisticated selection of European fabrics. We ship worldwide. Rarely does a manufacturer leave unchanged a product for more than 25 years, but this is the case with Royal-Pedic’s 7-Zone Royal Latex Mattress. Unlike mass-market mattresses made by well-known brands, this mattress is entirely hand-made of sustainable materials- natural Talalay-process latex from the rubber tree, and breathable, unbleached, undyed cotton. The natural latex core is composed of 7 zones of varying flexibility, so follow one’s body curves, especially for side sleeping. And this is a two-sided mattress, like all of Royal-Pedic’s products, to offer a much longer useable life than so-called “no flip” mattresses. And because there is no polyurethane foam or puffy polyester padding, one can expect to keep the 7 Zone Royal Latex Mattress at least 10-15 years. Personally, we have several of these mattresses in our home that are over 20 years old and still comfortable. Unlike synthetic, mass-market mattresses, which are made with off-gassing adhesives to hold the padding layers in place, this Royal-Pedic mattress is assembled using traditional tufting straps to keep the natural padding in place, without the need for toxic glue. We have always thought that the place where one spends 1/3 of one’s life should be entirely free of petroleum-derived glues, foams and fibers, and that is a value that is also held by Royal-Pedic. We show the 7-Zone Royal Latex mattress above on a boxspring base, but it may also be placed on a slatted platform base without boxspring, for a slightly firmer feel. The bed frame shown is our VERUS Cherrywood New Classic Sleigh. Our VERUS © Natural Edge Trestle Table is a contemporary take on a very old table from the Middle Ages. Back then, each trestle end had a third “foot”, which meant each trestle could be moved to allow very long top boards to be used. Our preference is to keep the floor as clear as possible and out of the way of feet. In fact, when we design your table, trestle or otherwise, we always take into account the size and number of chairs to be accommodated.We don’t just design our tables to please the eyes, but also to please the knees! And of course, we don’t have “standard” sizes or design details for our tables at Form & Function, any more than homes have “standard” sized rooms. We build to suit your needs, not our manufacturing efficiencies. And as always, professional interior design assistance is offered to help you edit your options. 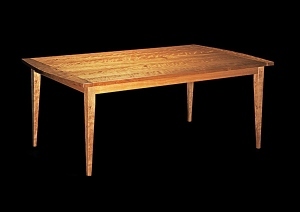 The table shown above was crafted from Eastern Black Cherrywood (Prunus serotina), sometimes referred to as the queen of North American hardwoods, with an Eastern Walnut ( Juglans nigra) cross-stretcher. We use only the highest quality of Cherrywood available, from the best region for this species, the Allegheny plateau in Pennsylvania. And we don’t buy “market quality” lumber, even at the highest grade, because the timber is only graded for minimum width of 5″, and lack of major defect. We purchase very large entire Cherrywood (and Walnut) logs, cut edge to edge to yield the natural bark edge, which we can keep in tact or trim. And each board is numbered and kept in sequence, so that the colour and grain match in each finished table, chair or cabinet reflects the way the tree grew. If you look at the table top above, you may see that it was made of only two very wide boards, perfectly matched as they came out of one log. You will never see a crack or split in a Verus© table; no matter how cleverly such defects are “corrected” with butterfly joints – spilled wine will always find those defects! This attention to detail may seem a little esoteric, but consider the lexicon of winemakers and, increasingly, craft beer makers. We think the nuances of fine hardwood furniture deserve at least the same attention! Hélium is the most popular sofa design from the highly-respected manufacturer, Duvivier of France. The classic and elegant shape of Hélium is right at home in a contemporary as well as traditional home. Its modest scale, available in three sizes as well as a an armchair, suits an old apartment in Paris as well as a modern, space-challenged condominium anywhere! Like all Duvivier designs, equal attention is paid to quality of raw materials, the skill of the craftsmen and craftswomen, as well as the overall design. All frames are hand-made in-house of solid Beechwood and multi-ply Beechwood panels to ensure long-term strength and rigidity. A patented double bearing stainless steel suspension (SPD Suspension) guarantees a unique, progressive comfort, without any of the noise common in older spring systems. Hélium is available in 239 fabrics as well as 36 smooth and nubuck leathers. Duvivier is devoted to only using the finest upholstery leathers, produced by France’s finest upholstery leather tannery since 1927, known as Remy Carriat. Much the same as how a winemaker knows that the soil and climate affect the quality of a fine wine, Carriat only selects young European bullhides with a high collagen and elastin content to ensure leather that remains supple without stretching, for a lifetime. We invite you to visit our showroom to see Hélium and other favorites designs from Duvivier, and touch and feel the leather equivalent of a Premier cru Bordeaux! At Form & Function, we ship worldwide. VERUS Stanley Bed with natural top edges as shown in Eastern Black Walnut (Juglans nigra), is a modified version of our original Stanley Bed. For this version,we have chosen to leave the natural log edge intact, after debarking, on the top edge of the headboard. Its a subtle reference to the origin of the timber, without becoming cloyingly so. A closer look will reveal our signature attention to board match. Rather than the factory approach of glueing up narrow boards from various logs at best, or more commonly, veneers over particle board, we always carefully match exceptionally wide boards, sawn in sequence that we can finish without the necessity of wood stains. This presents an “unmuddied” grain appearance with no artificial colour. This is our signature approach to every VERUS piece we make, essentially a way of respecting a 60+ year old tree by bulding furniture that brings out the inherent beauty this wonderful, sustainable resource. Notice that the “cathedrals”, or flat grain arches on the headboard, are matched and are never truncated. The side, foot and head rails are cut from matched 2″ thick lumber instead of mass-production 1″ material, to ensure stability and strength and to add slightly more mass to an otherwise light scale design. This image shows The Stanley Bed designed for use without boxspring. However, like all of our beds, we can build it to accept mattress and boxspring. And of course, we offer a wide open range of bedroom storage options to complement The Stanley Bed – night tables, chests of drawers, wall-mounted shelves, mirrors and more. This image also shows our Organic Royal-Pedic Natural Latex Mattress with separate top Comfort Pad for a pure sleep environment free of petroleum-based urethane foam and questionable fire-retardant chemicals. At FORM & FUNCTION, we have always believed that the room where you spend 1/3 of your life should always be not just restful and beautiful, but also toxin-free. In search of the perfect pillow. Four years ago we decided that our pillows at home were well past their best-before date, and that it was time for a change. One of our customers had told us about his wonderful alpaca wool pillows and, knowing how fussy he is about quality, we tracked them down and ordered a few to test. After trying four or five different pillows over the years, from Hungarian white goose down to latex and wool mixed, to specially-shaped “orthopedic” pillows, we’ve finally found our favorite combination of comfort, shape retention and breathability. Our Alpaca Pillows have a casing of 100% organic cotton, with a very tight weave to provide a barrier to skin scales and dust mites ( and what the mites leave behind after lunch). So unlike most pillows which are supposed to be replaced every few years to avoid an allergen build-up, our Alpaca Pillows will stay fresh and clean for years. Still, we suggest another protector over the pillow, before the pillow case goes on. 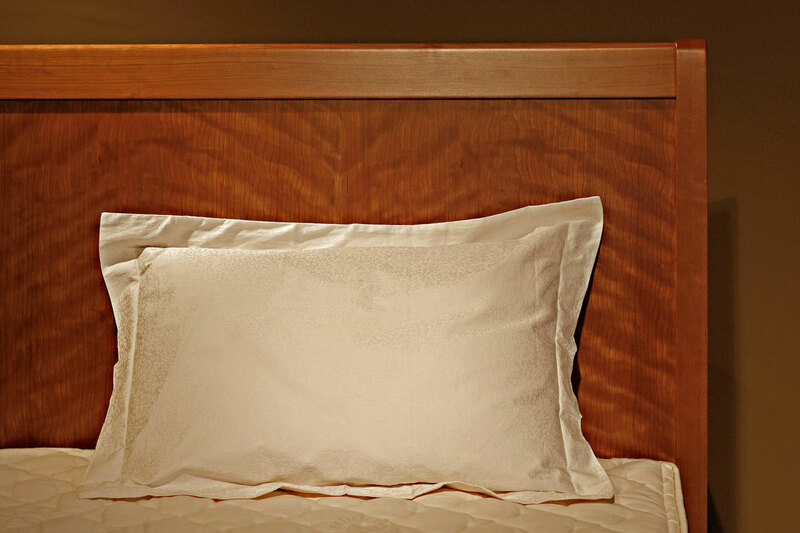 Our Pillow Encasement is made of the same super tightly woven organic cotton as the casing, with a zipper to allow removal for hot water washing. This provides one more allergen barrier as well as protecting your pillow from hair oil, makeup, perspiration etc. Many of our customers have started with the Alpaca Pillows, and then try our Alpaca Duvets. In our home we switched from down to Alpaca and we love the difference. Because each Alpaca fibre is hollow, an Alpaca Duvet requires much less fill than down or feather or sheep wool, and so each duvet is remarkably light, yet insulating. We also find that these duvets are more breathable than the alternatives, and so a comfortable body temperature is easy to maintain. 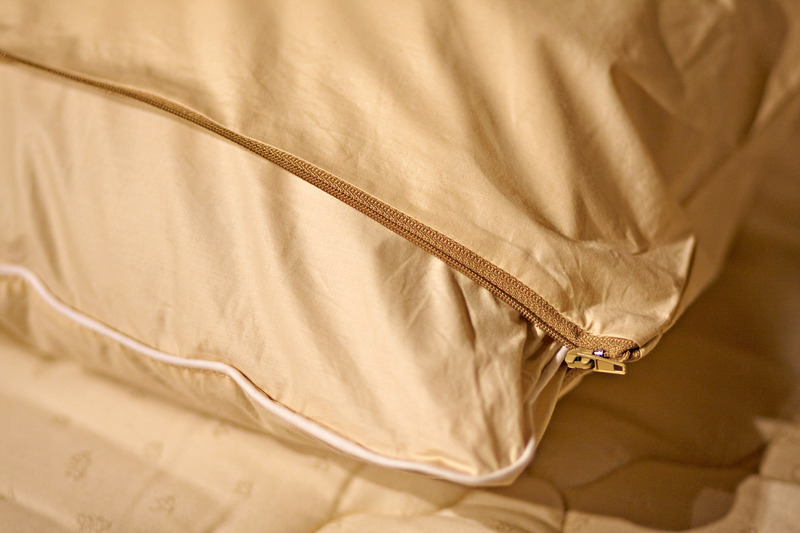 Like our Alpaca Pillows, our Alpaca Duvets are encased with the same Austrian organic cotton casing. The same 4.5 micron weave ensures that dust mites and their 10 micron “post-lunch offerings” cannot penetrate the casing, so your Alpaca Pillows and Duvet remain immaculately clean without washing or dry cleaning. 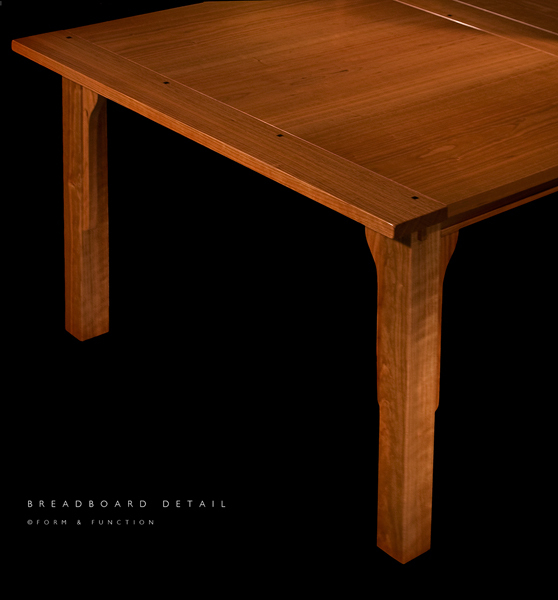 For more than 15 years, our VERUS Breadboard Table has been a favorite design at Form & Function. The Arts and Crafts details like the apron tenons brought through and exposed on each leg, and the corbel supports, reference a solidity and strength, key elements of this style. 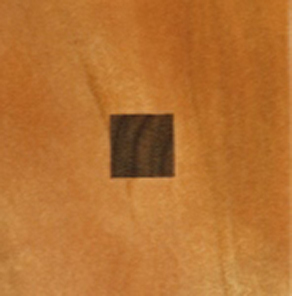 The breadboard ends are uniquely joined by square Walnut pins, which connect these elements in a “floating joint,” without any glue needed. In fact, the breadboard ends cannot be fastened with glue or else the table top will not be able to expand and contract, as solid wood does throughout seasonal weather changes. The Breadboard table shown including top, apron and corbel supports has been hand-crafted in our workshop, using three sequentially-sawn Cherry boards from the same massive Black Cherry log. This technique allows us to offer perfect matching grain and colour. The legs have been cut from one Cherry board, 3″ thick, to ensure there are no unsightly lamination lines to interrupt the flow of grain. At Form & Function, we have no “standard” sizes for this table or any of our other table designs. We build it to suit the room size and number of people, and it may be a fixed size or it may have one or multiple leaves. We can build it without the corbels or through-tenons for a more contemporary room, the legs can be tapered for a lighter look, and even the top thickness can be varied to suit the scale of the space. 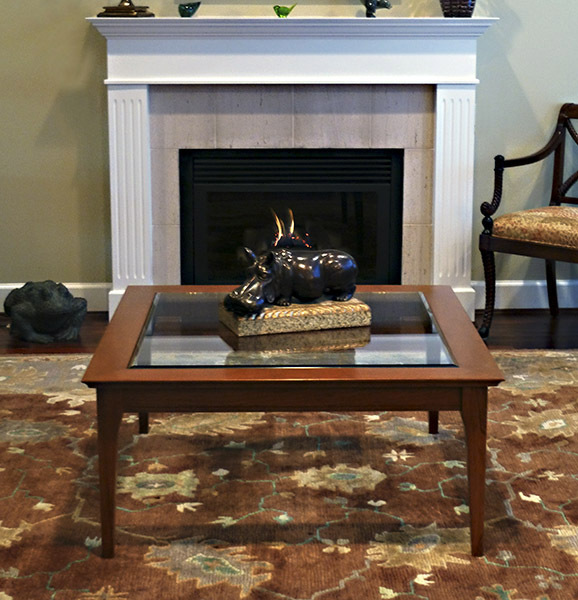 To learn more about this table, or to inquire about other pieces, please contact us. In 1907 Marshall Burms Lloyd invented a process to weave twisted kraft paper around steel wire, thereby revolutionizing the wicker industry. 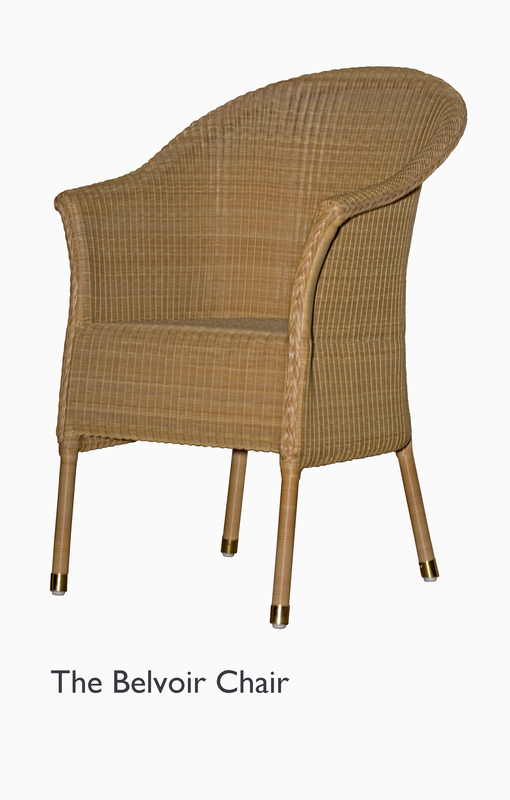 Throughout the first half of the 20th century, Lloyd Loom furniture set the standard for extremely durable, comfortable and weather-resistant woven furnture. At Form & Function, we are pleased to present the complete line of Lloyd Loom furniture for indoors and out, currently produced in Britain by Lloyd Loom of Spalding. The outdoor range is made with stainless steel wire and a special UV-resistant material called Rehau cord, produced in Germany and rugged enough to be left outdoors year round but elegant enough to be used indoors. The indoor range we receive “in the white”, that is without finish. This is allows us to finish your Lloyd Loom in wood stains to match your cabinetry or furniture, or in any colour from any paint manufacturer. This includes, of course, the Farrow and Ball range from England! We invite you to click on the “Lloyd Loom of Spalding” link at the bottom of this page to see the entire design range. Our VERUS Bow-End Table is a variation of our 1989 Shaker-influenced Canterbury Table. The added details include 2 bread-boarded, bow-end pieces attached to each end of the table top using dry-fitted tenons which are “pinned” by square pegs of Black Walnut. There is no glue used, so the joint can move with the seasons. This shows a delightful “evidence of the hand”, rarely seen in factory-made furniture. It requires a very skillful hand to execute perfectly. One slip of the square-mortising chisel and the top is ruined! The legs are also given a little added dimension in the top section. The table shown is a fixed size, which we build to suit the room size and number of chairs to be accomodated. 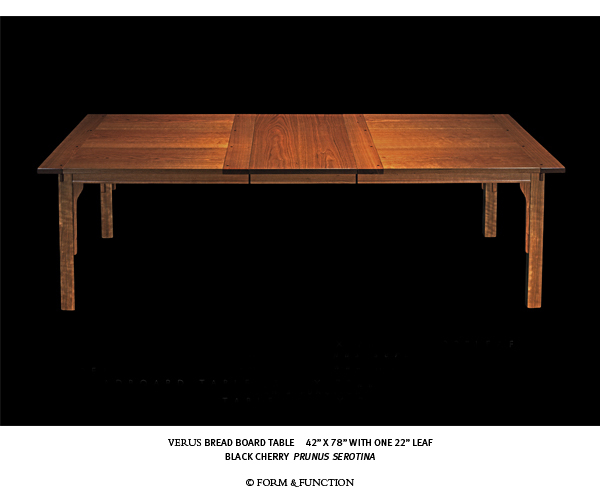 Like all of our VERUS tables, it is also available with one or multiple leaves in any width or length. Not sure of the optimum size for your room or not-yet-built room? Just call and talk to Susan! She lives and breathes space-planning, and will gladly help with your architect’s or builder’s floor plans. If its an existing room, she always suggests a visit to check dimensions, scale of the room and details of any existing furniture. Lynne’s bright and shiny brass & glass coffee table has found a new home, and we think her new Elizabeth Cherrywood (Prunus serotina) conversation table is adjusting very nicely to its new home. We gave George Johnstone a break from all the heavy dininig tables he’s been making, and he enjoyed fitting the mitred top together beautifully, and making sure the 10mm bevelled glass insert fitted exactly.